You’ve been working out and you’ve changed your diet, but one area of your body is defying all of your fat-reducing efforts. For example, there are no exercises to help take care of a fat pocket under your chin. If it’s your abdomen, thighs, “love handles,” bra-lines, or chin, you might be the perfect candidate for SculpSure®. SculpSure is an FDA approved non-invasive light laser for lipolysis or permanent fat cell removal. Although it is not a weight-loss treatment, SculpSure permanently removes pockets of stubborn fat giving you a smoother silhouette. Experience SculpSure body and chin contouring under the guidance of Janet Goodfellow, MD, Sheryl Long, MD, and Ronald Young, MD. This quality team of physicians in Irvine Family Care, are located in Irvine, California. Call or schedule a consultation online or over the phone today. SculpSure is a laser treatment that uses targeted laser energy to heat only fat cells to a temperature that destroys them while leaving the skin and surrounding tissues unaffected.Compared to other fat-removal procedures — such as liposuction, fat freezing or similar laser treatments — SculpSure is a safer and more comfortable procedure. The treatment is customizable and tightens skin, so your curves are smoother and have no dimpling or pitting. When the treatment begins, the device will be placed on the targeted area. The laser goes through cycles, heating, and cooling during the treatment. This cycling keeps your skin comfortable while still allowing the fat cells to be super-heated. You may feel a deep tingling or a sensation of warmth. What is the SculpSure body contouring process? The treatment takes 25-30 minutes, as the heat from the procedure damages the fat cells beyond repair. Over the next three months, your body will eliminate those cells through your lymphatic system. You’ll likely start to see some results in a matter of weeks. Depending on your goals, you may need more than one treatment. Before undergoing the procedure, one of our physicians will talk to you about what you want and should expect from SculpSure treatments. How fast is SculpSure body contouring treatment? Compared with other body sculpting procedures, SculpSure is fast. Treatments can usually happen in less than a half-hour, and there is no recovery time necessary. Some people refer to it as a “lunch hour treatment” because you can have the procedure during lunch and return to work immediately. Once the fat cells have been destroyed and removed through your body’s natural processes, they are gone for good. Is SculpSure body contouring like surgery? One of the best aspects of SculpSure for fat elimination is that it is nonsurgical. The device sits on top of your skin during the procedure. This means you do not have the associated surgical risks of infection, recovery care or pain. Studies of the procedure show that you’re likely to see about a 24% reduction in fat in the treated area after one treatment. You’ll see changes in as early as 6 weeks with full results in about 12 weeks. Irvine Family Care is one of the very few offices that offers Nitronox! This cutting edge analgesia delivery system makes your treatment a comfortable experience. It is especially convenient because you do not have to remember to take any medication ahead of time, so there is no need for a designated driver to or from your appointment. Because Nitronox leaves your system immediately, you will be able to safely drive within minutes and return to your normal daily activities. 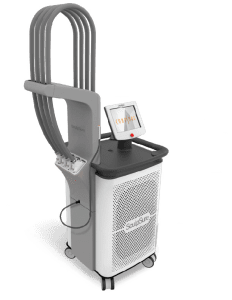 Why is Irvine Family Care offering SculpSure? Being committed to your overall health, the physicians of Irvine Family Care had not found a procedure that had met their high standards of care until now. SculpSure is that new technology! If you would like to learn more about SculpSure and find out if you may be a candidate, book an appointment online or by phone with an expert at Irvine Family Care. SculpSure may be the solution to that bulge that has annoyed you for years and help you on your path to optimizing your well-being.